Is the expression that tennis is a sport for the rich still true? Will we see the correlation between income level and success in tennis? This post is follow-up to the analysis of “The most tennis countries” post I wrote couple months ago. Important to note that population column contains population of all countries that belong to the corresponding group, not only those where are top tennis players exist. Relative numbers are calculated as ratio of top male or female players divided on total population. 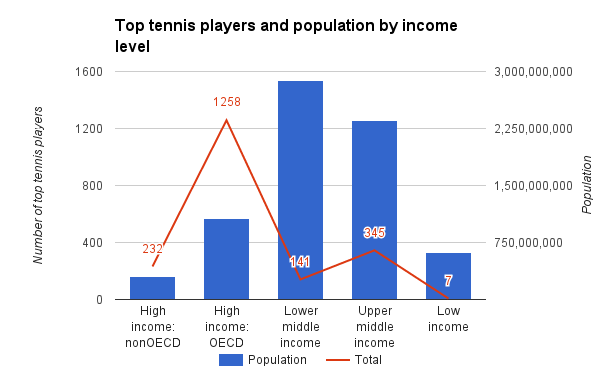 It is clear that there is direct correlation between income group and number of top tennis players – richer countries produce more tennis players. Couple charts below illustrate that point in more visual way. As you see, High Income: OECD countries with total population just above 1 billion population produce collectively over 60% of players in men and women top 1000. The poorest countries with 600 million in population are home of just 7 top players. 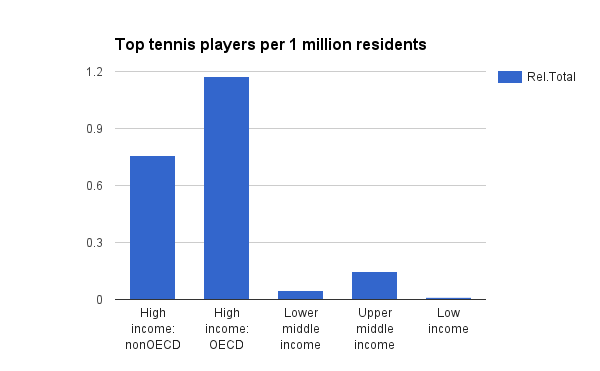 In relative numbers the different between High and Low income is astonishing: 1.17 and 0.01 top tennis players per 1 million of population, over 100 times. Especially low is number of women from low income countries – there is only one among top 1000 players in this group (Valeria Bhunu from Zimbabwe). So based on the numbers I have to agree that tennis is a sport for the rich, at list on country income level. What traffic channels really drive ecommerce revenue?